In June my friend Anita invited me to participate in a swap/exhibit put on by Art with a Heart in Altrincham, England. The theme was “In Bloom” so I had to do something with a floral theme. So I figured, hey, why not? Sure I hadn’t drawn or painted any flowers in a couple of years, but since it was early in June I had all month to practice and it would all be cool. But it wasn’t. I forgot all about the swap! I got a message reminding me that the cards needed to be in the UK by the end of June. This was one week away. I figured I would need at least five days for the card to get to the UK, so I needed to make something fast. I rummaged around and sketched and gritted my teeth. Nothing happened. So I just threw up my hands and said, “I give up!” and just let go. I decided I’d loosen up by drawing the impression of a flower and recklessly drew squiggles and then looked for some shadows to play with. Before I new it I had this card. By just messing around I ended up with something so much nicer than anything I worked hard over. Relaxing and seeing what happens works for me. Why do I not remember that? Ever? My card made it to the exhibit in time, the cards were displayed through July and I’ll get a lovely card back in the mail sometime soon. All that fuss for nothing. 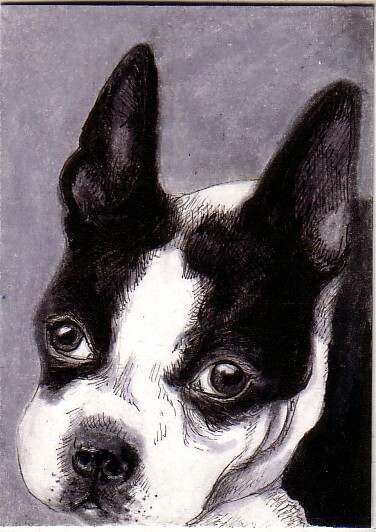 Enjoyed making this ATC for a trading partner I got acquainted with on my art trading site. Turns out we are both Tom Hiddleston fans, so she requested a drawing of him as Loki from Marvel’s Thor series and I was happy to oblige. I’ve never had much luck drawing Mr. Hiddleston, but this time it worked out. So thanks out there to Therese in S. Africa. 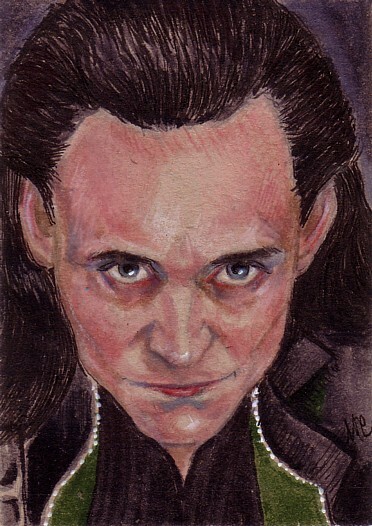 Your Hiddles card is on it’s way to you. Happy Fourth of July to my U.S. friends! Enjoy the long weekend. The other day I posted about the Secret Solstice gifts I made last month. Here’s the second gift I made. 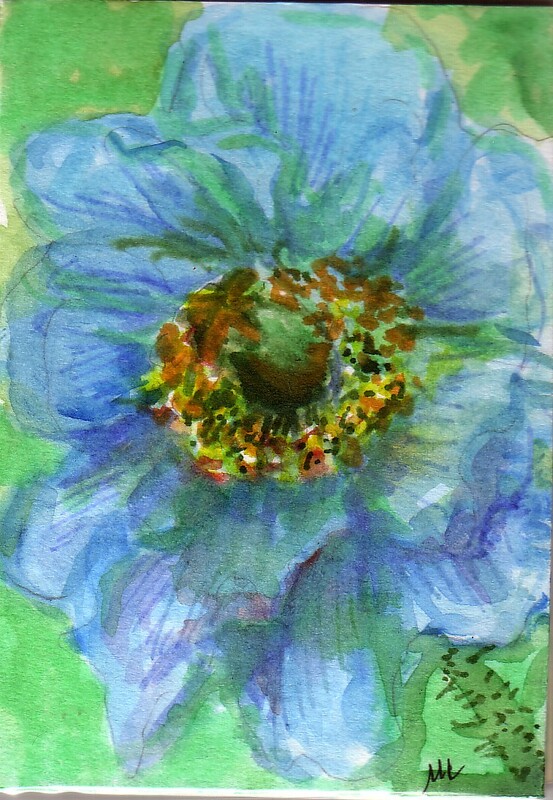 This was for my old mail art pal Annette. We’ve traded a bit here and there for about five years now. I knew she was a Poe fan and since I’d been drawing a lot of Edgar Allan Poe portraits this year I felt it would be pretty easy to do another. 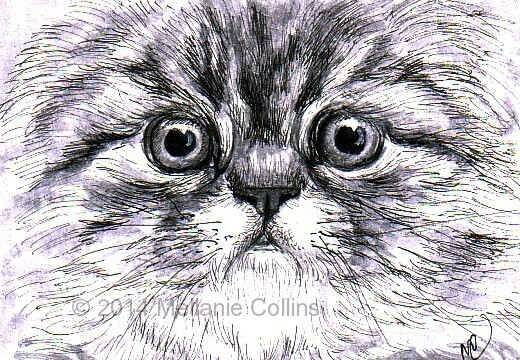 This one is 5″ x 7″. It was nice to work a little larger than I’m used to. One more gift to go…coming soon. 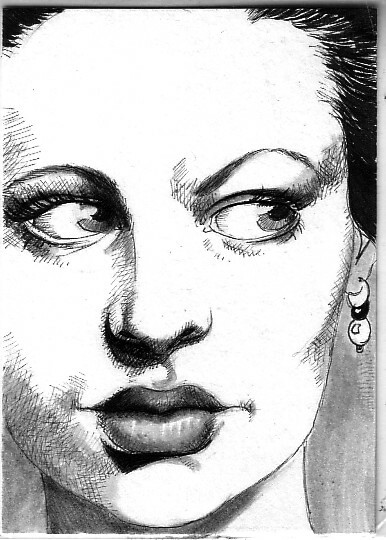 Here’s another film noir-inspired ink portrait. This woman is checking over her shoulder because she thinks perhaps she saw something odd out of the corner of her eye. Or not. I received another request for a Poe artist trading card. 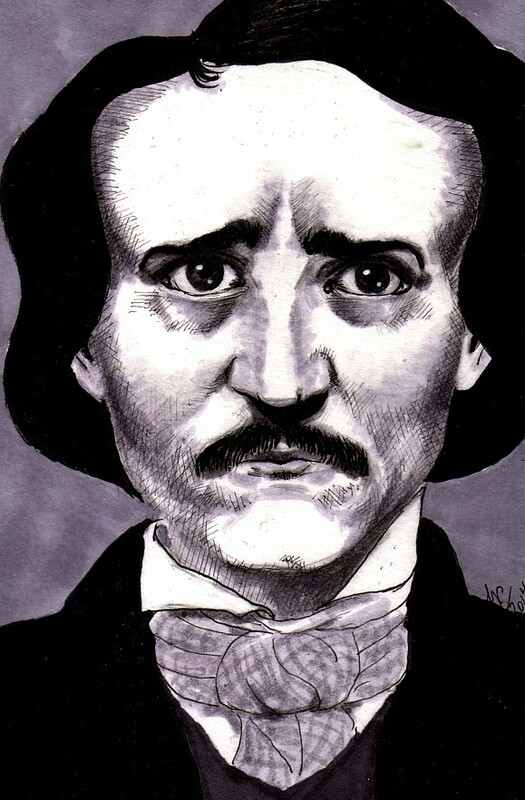 Folks sure like their Poe. I think I might have made this one a bit chubby. To any of you who have liked my Facebook Page: Hugs and kisses to you all. I already have 122 fans and counting. It’ makes me so happy to have so many people following my work. This month I’ve been working on some gifts for a Secret Solstice swap on IllustratedAtcs.com. I have three partners so I’ve been busy trying to make some special goodies for them. Once they’ve received their gifts I’ll post some images here. I love making art for people. It’s all part of the equation isn’t. Make + Share = Fulfillment. At least that’s the equation that’s working for me right now. Not much going on in March and April. Too much useless introspection and not enough art-making. The plan for May is to fret less and draw and paint more. Here they are! 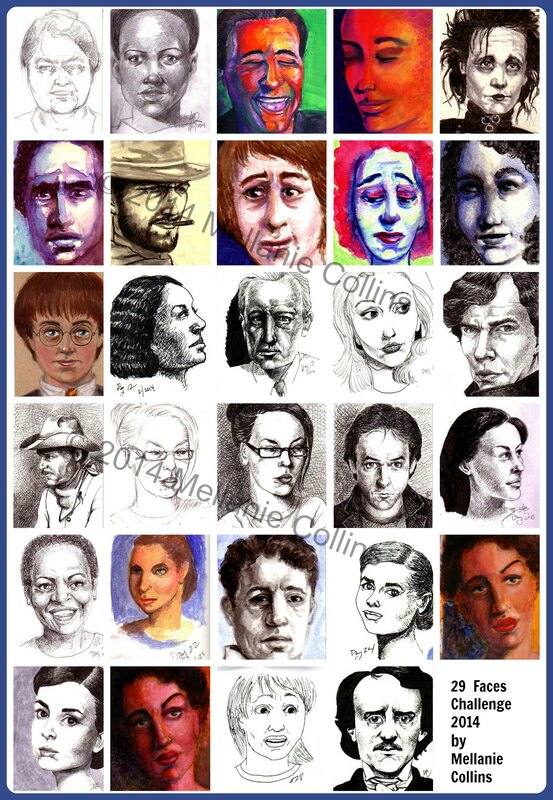 All of my faces for the 29 Faces Art Challenge. During this challenge I learned a lot about what stops me from practicing every day. I also finally seemed to understand that not all drawings are going to be good ones, no matter how much I practice. In the past I drew in fits and starts. If it didn’t work I’d get into a funk and drop it for a while. But now I see that by doggedly sticking with it I end up with far better work and more work that I am proud of. Thanks to Ayala Art for the challenge.